Good morning! Happy Monday and all that. Did you have a good weekend? I hope so. I had plenty of sewing to catch up on, so I was pretty busy with that. Lots of odds and ends done, behind the scenes boring stuff that needs doing but just isn't blog post worthy. My one question is, when did MS Word get so fancy? Holy cow, it had been a long time since I cracked that open and wow! I just have barely enough brain cells left to figure it out! So did you notice that Camille has the Sundae Scallop Sewing pattern available? I'm pretty sure I had that pdf downloaded before she clicked enter on that pattern! I loved those scallops so much. I've already got a little kit ready for myself when I have a free moment since we're on pre-market lockdown. 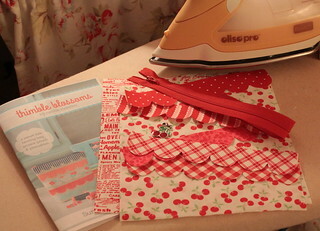 I'm going red and white for my first bag, with my little cherries for the outer bag and the Recipes for Success print on the inside, with lots of red and white scallops. I'm only scalloping in one side but I think it will still be cute. I didn't have any linen laying around, so I am going to fuse some interfacing onto my outer fabric to make it a little sturdier. And holy cow I can't believe I could actually find that cherry zipper pull from YEARS ago. It seems so perfect! I have things coming up on the horizon that I can't wait to share. Hope you have a great day my sweet little raindrops! Your little bag is going to look beautiful with those fabrics and scallops. I was thinking of you all weekend as our son was on a business trip in your area. Wish I could have squeezed in the suitcase and visited you to share a cup of coffee with. Lookin' good! I'm on a fabric "no buying" streak. I'm good since January--but this PKM red line might....just...break me! Well I haven't been in market lockdown just work travel and projects. I sure do miss time with my fabric and thread. A few weeks yet before things settle down a bit. Squealing over your colors and fabrics! That will be so cute! Thanks for all the inspiration! Can't wait to see what you're working on! It's going to be adorable! I always know it's spring, not from the first robin sighting, but the words, "pre-market lockdown!" Can't wait!!! Hey Pam....have you tried Google Docs? Much more user friendly than Word! I love your little scallops - what pretty bags they will make! Those fabrics are perfect for your new bag! Can't wait to see what you're working on for market. And what fun name will you come up with this time?